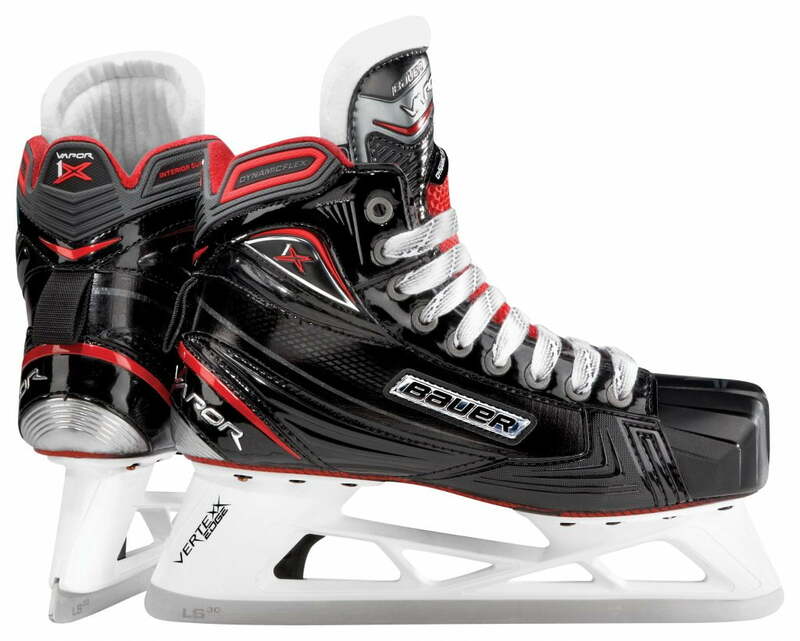 Bauer Vapor 1X Junior Goalie Skates | Sports Etc. The Bauer Vapor 1x goalie skate is lightweight, mobile and protective—the VAPOR 1X goal skate is perfect for goalies who are quick on their feet. Designed to bring a new level of agility to the game’s most dynamic goalies. The 3mm extended facing allows the goalie to stay in attack position while adding more wrap for better overall fit. The Dynamic Tongue Flex molded insert gives goalies an edge by acting like a spring to move them forward into their stance. The Curv™Composite Quarter and Composite Outsole on the VAPOR 1X goal skate reduces weight, increasing stiffness for better weight transfer and increased quickness. The Vertexx Edge holder is a goalie-specific holder that eliminates the cowling and adds extra height, giving it a superior attack angle. The added advantage of a removable steel that’s ready in an instant means quick goalies just got quicker. Sports Etc Performance To Value Rating– 10 out of 10– One of the best skates available for elite level goalies looking for a performance skate. The lightest goalie skate ever made.